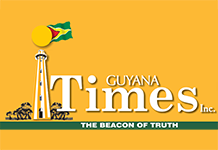 The Guyana Jaguars batsmen are seemingly coming of age as the defending champions racked up their second successive 400-plus first-innings total this season, with a few of their batsmen hitting triple figures to further highlight their prowess. seems to be overshadowing any errors that they might have made to date. 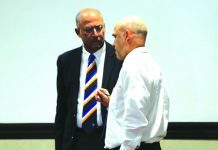 The senior men, as predicted, have been more impactful than before as they seem to be a bit more mature in their approach to Four-Day cricket. Anthony Bramble’s knock in the first innings against the Windwards Volcanoes was a testament to the responsibility shown by one of the seasoned guys. After slamming a ton against Barbados, the wicketkeeper hammered 168 off 151 balls in a canter of an innings, which took Guyana from a harrowing place of 70 odd for the loss of three wickets. Bramble’s knock was his second 150-plus score in First-Class cricket, further highlighting the importance of senior batsmen stepping up. The Jaguars’ other centurion from round four was Tagenarine Chanderpaul, who played a completely opposite innings from Bramble. The left-hander has been in good touch this season, managing a few good scores, but his workman-like century was a demonstration of his temperament and ability to grind the bowlers. Chanderpaul’s role at the top has come under scrutiny at times owing to his lack of aggression and not being able to convert strong starts into big scores. 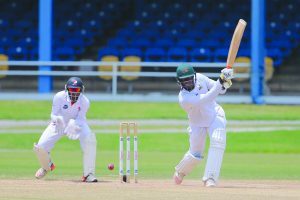 However, it seems like the son of Windies legend Shivnarine Chanderpaul has finally found his rhythm and could churn out more triple-figure scores in the rounds to come. balls from all-rounder Romario Shepherd, who kept the line-up firing despite a few hiccups. 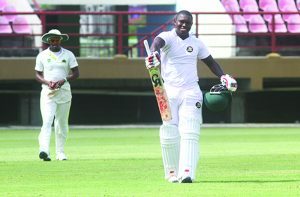 One of Guyana’s frontline pacers, Shepherd is also a player who could join the ranks of Paul, Hetmyer and Sherfane Rutherford should he continue to rack up more scores of 50 or more. With Clinton Pestano continuing to chip in with useful runs, Shepherd, batting at number seven, has the important role of being the barrier between the bowlers and the ‘tail’, which can certainly wag if needed. 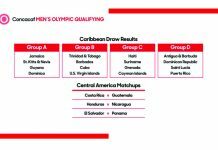 Apart from the boon of the Jaguars batting, the downside is that Johnson especially will need to throw up a few big scores at number three, given that Vishaul Singh, Raymon Reifer and Chandrapaul Hemraj are on international duty with the President’s XI squad. Notwithstanding the few worries with the bat, issues which will likely be resolved by the next round with Johnson and company possibly coming to the party, the Jaguars will want to continue posting 400-plus scores batting first. 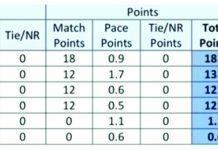 With six rounds left, it is clear that the Jaguars could see a number of their batsmen finishing in the upper echelons of the run-scorers when the tournament ends.